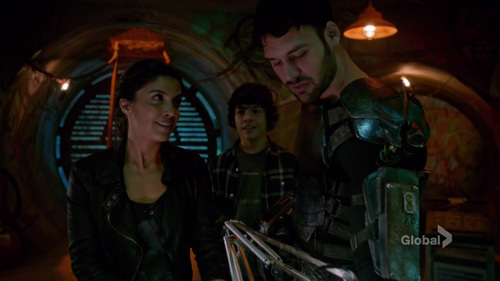 Things kick-off at an abandoned hospital, where Farah (Nazneen Contractor) is treated by Carlos (Ryan Guzman) after Micah (Noah Gray-Cabey) uses his powers to restore the building's power. I hope you enjoy this scene, because all three characters had very little bearing on anything else going on. Last week's cliffhanger saw Nathan (Robbie A. Kay) trapped inside the Evernow game-turned-prison, condemned to wander its endless corridors. In the real world, Erica Kravid (Rya Kihlstedt) assured her chosen frontiersmen (and women) that they'll soon be whisked away to the future, avoiding the approaching solar flares. 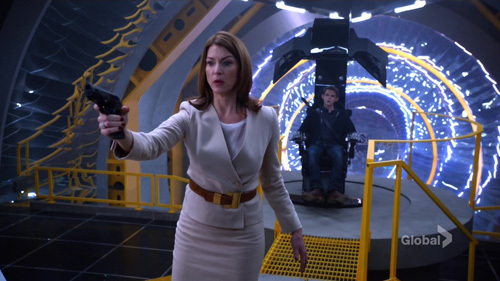 In vaguely Matrix-y scenes, it turned out that Nathan's time-travelling powers were still required to transport everyone thousands of years into the future, but now this requires him to be virtually hooked up to the Gateway device using a nasty tendril that plugs into his neck. Having owned one of Erica's wristbands, Ren (Toru Uchikado) manages to find the comatose Otomo (Hiro Kanagawa) and his daughter Miko (Kiki Sukezane). Ren appears to be slow on the uptake, as he seems to think the real Miko (who has been imprisoned and asleep all this time) will remember him, but he only actually befriended Otomo's avatar of her. 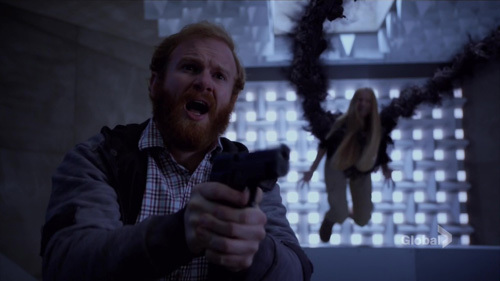 In one of the episode's weirdest scenes that stretched credibility (and there were a few), after getting Malina (Danika Yarosh) and Quentin (Henry Zebrowski) to safety at the present-day Gateway, Luke (Zachary Levi) decided to sacrifice himself. Frankly, it was difficult to understand exactly what he was thinking, or why any of his plan worked, but Luke somehow levitated into the sky and... I don't know, blew up? 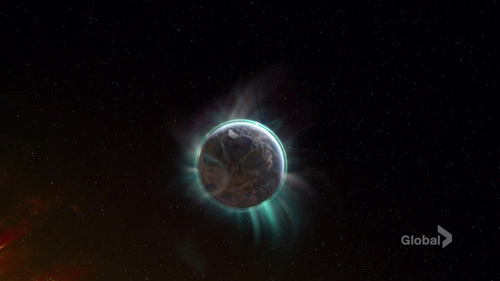 Somehow, this dissipated the first of the solar flares. 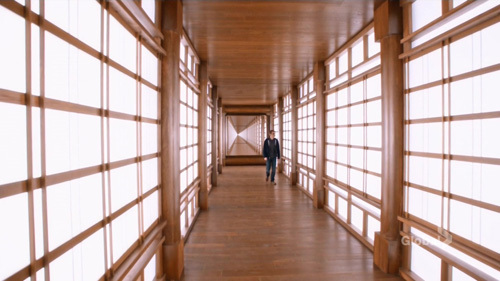 If earlier scenes in Nathan's virtual prison felt stolen from The Matrix, subsequent scenes felt borrowed from the ending of Interstellar (no spoilers). 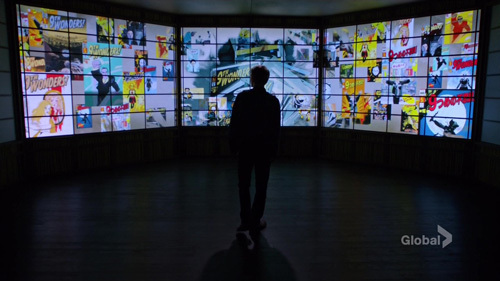 Here, Nathan realises the virtual world could allow him to access all his forgotten memories, so it was actually a very handy place to get a refresher on his entire life and 'witness' past moments that can inform his future. Oh, Erica. You didn't think this one through, did you. Aware her destiny awaits at the Odessa clock tower, Malina races up its stairwell with Quentin but was snared by one of those power-sapping oily tendrils from emo Phoebe (Aislinn Paul). It seems they've always had the ability to pick people up? Oh. OK.
Quentin pleads for his sister to release Malina, but it falls on deaf ears and he's forced to kill her. 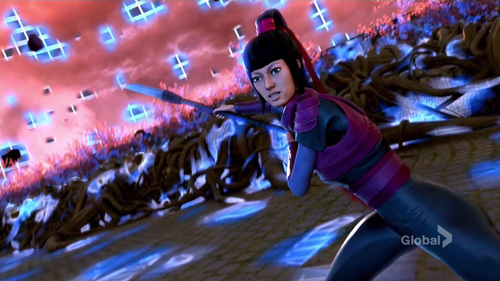 The awakened Miko and Ren enter Evernow together to release Nathan from the game. In the past, Malina decides to try and stop the second solar flare's extinction-level arrival by using her abilities to control nature single-handedly. In the future, her brother Nathan's getting a better understanding of exactly what they're supposed to do to stop the H.E.L.E (Human Extinction Level Event, I've learned!) 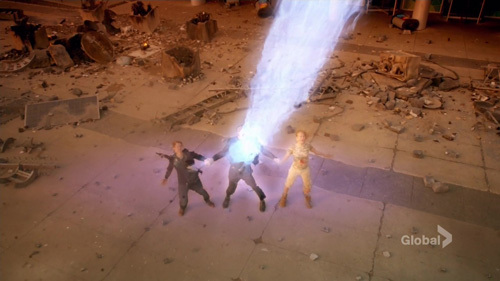 He relives a memory of Angela Petrelli (Cristine Rose) teaching them to combine their abilities to form a kind of super-blast of blue energy. Uh, riiiight. 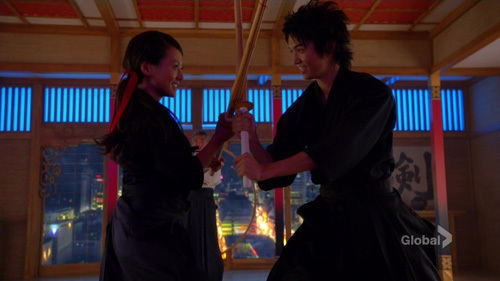 Miko and Ren spring Nathan from jail, who teleports to the future Gateway facility to face Erica. Having apparently spent a long time in the timeless environment of Evernow, practicing and improving his abilities (shades of Inception now? 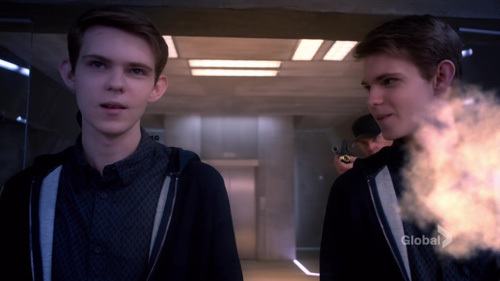 ), Nathan has managed to find a way to use time-travel to essentially create a "time twin" who can help him save the world in both time periods. You with me on this? ... step forward Noah Bennet, who we learn was plucked from his timeline (nanoseconds before being crushed by a falling car) by his grandson Nathan. It seems his destiny is to help his grandkids save the world. So there we have it! 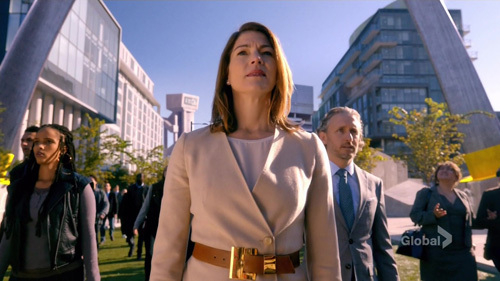 Noah is taken to the present and becomes the conduit that stops the solar flare from devastating the planet. Huzzah! 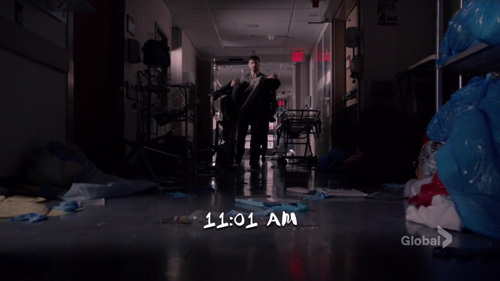 I wasn't emotionally engaged with this episode for most of it, but I must confess Noah's actual death scene had a bit of weight. Not much, sadly, but enough to be memorable. 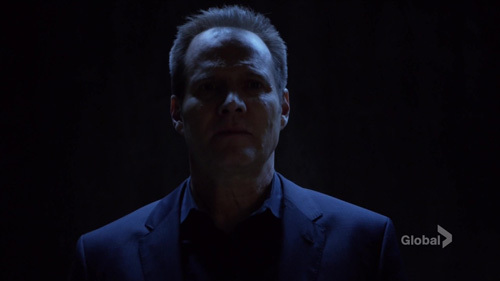 Jack Coleman's been the standout of Heroes since it began, and obviously its most valued character for many reasons, so seeing HRG shuffle off this mortal coil was a good moment. 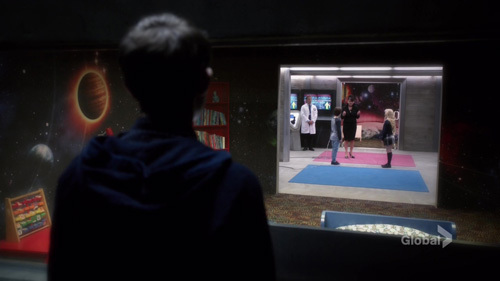 And I appreciated this shot, which actually communicated WTF they were trying to do: create a planet-sized force field. 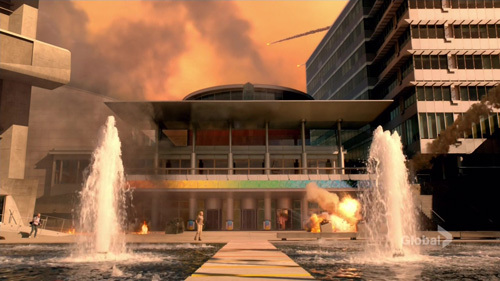 In the future, the other Nathan (although it's sort of the same one really) bids farewell to Erica and the Gateway facility implodes. Three months later, the imprisoned Quentin is being interrogated by federal agents who are still asking about EVOs like they're some dangerous rogue element. But he calmly explains they're not special, they're just ordinary people who stepped up to the plate when it mattered. Don't be racist, you guys! ... and Malina goes to high school. But, uh-oh, she finds a mysterious Tarot card has been planted in her locker... just as her brother discovers one, too. As her grandmother reveals in the car after school, the Tarot card is a warning from their father. This is clearly setting up another storyline, but I was racking my brains trying to remember who their biological father even is! It turns out I'm not going crazy, because he's only been mentioned in an e-book to accompany the series. For those who want to know, he's an EVO called "Hammer" that was saved from a lynch mob and slept with Claire in Italy. 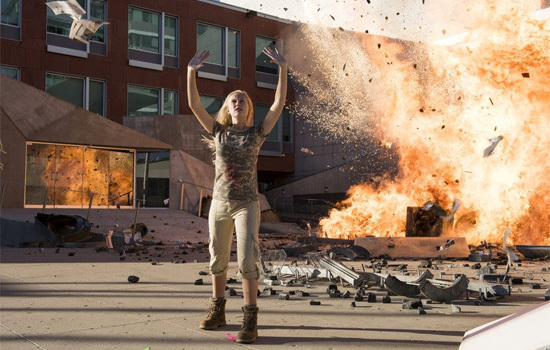 Will the ending of Heroes Reborn forever haunt it? 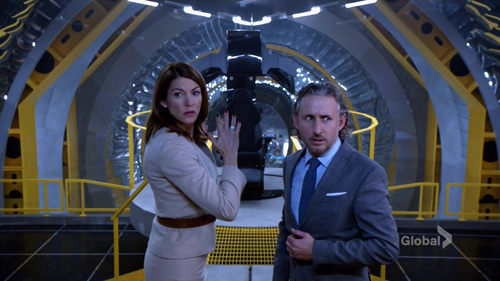 Everything about the denouement suggests that Tim Kring thought NBC would commission another 'event series', but instead the network recently confirmed they won't be asking for any more because of low ratings. 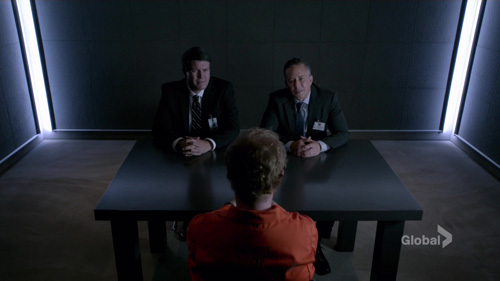 So was Kring simply foolish to add this tease for more episodes, or does he know something we don't? If NBC aren't keen for more Heroes, will Netflix ask for another run? 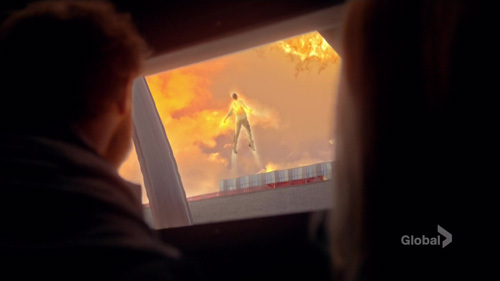 It feels like part of the reason Heroes came back is because the original four seasons have been very popular on the streaming service, so one assumes the same will be true when Reborn reaches it. Low ratings aren't always the whole story these days. We all know how they can misrepresent the truth. 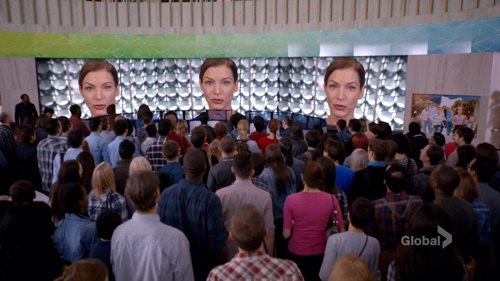 Netflix actually know how many subscribers watch Heroes, to an exact head-count. I'm just saying that Heroes might be back, again. You never know. 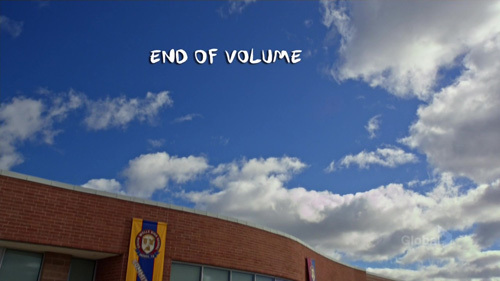 This was a decent enough send-off, considering the mixed quality of Heroes Reborn (certainly in the final half). Enough of it made sense, and any of the 'cheats' didn't make me wail in anger. I just rolled with it. I liked how things resolved with Noah sacrificing himself, even if I don't understand why 'a master of Space and Time + a Master of Nature = giant force field in space'. But I don't think Erica Kravid got the comeuppance she really deserved. There were problems with everything, but isn't there always? I was much happier than I'm used to being with Heroes. 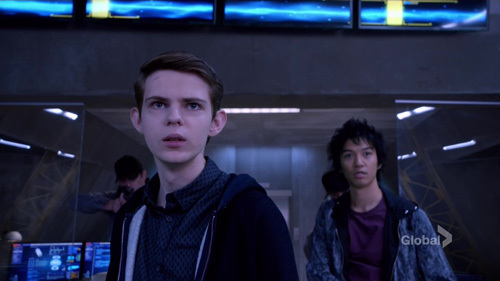 Ultimately, I stand by my belief Heroes Reborn is the second-best season of this show, after the first, and in some ways improved on season 1's formula. It definitely helped only having 13 hours to fill instead of twice that, although I have a feeling it would've been even better with a tightly-focused 10. It just became clear (through the lack of online chatter, and comments here) that few people really cared about Heroes coming back. They'd been burned too badly, or didn't think the show had evolved enough since going off-air. I take their point, because this series looked and felt like a throwback to 2006. It wasn't doing anything very new, it was just giving the remaining fans more of the same... but better than usual. I just can't grumble about that too much. 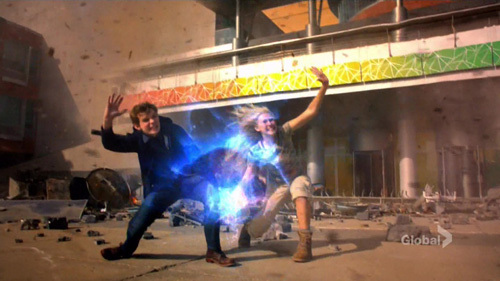 I had fun watching Heroes Reborn, and I think more people would have liked it if they'd been less cynical.